A memorial wall dedicated to George Kastrioti (1405–1468), also known as Skanderbeg, the national hero of the Albanian people, who repulsed 13 Ottoman invasions between 1444 and 1466. Albania is a country in southeastern Europe in the western part of the Balkan Peninsula on the Strait of Otranto, the southern entrance to the Adriatic Sea. Present-day Albania is bordered by Greece to the south, Macedonia to the east, the Adriatic Sea to the west, and Montenegro and Kosovo to the north. Albanians are believed to be the descendants of the ancient Illyrians, who lived originally in central Europe and migrated south to the territory of present-day Albania sometime around 2000 BCE. Because of its strategic location, Albania has been used as a land bridge by conquering armies and empires whose ambitions reached farther afield. In the second century BCE Albania was conquered by the Romans. Beginning at the end of the fourth century CE the Byzantine Empire seized the territory of present-day Albania. In the following centuries the country was invaded by Visigoths, Huns, Bulgars, and Slavs. In the second half of the 14th century, when Sultan Murad I (r. 1362–1389) began to expand his territorial possessions in the Balkan Peninsula, Albania became a target of Ottoman expansion. A coalition of Christian states under the leadership of Prince Lazzar of Serbia fought the Ottomans but was eventually defeated at Kosovo Polje (Plain of Blackbirds) near Pristina in present-day Kosovo in 1389. Murad I was killed on the battlefield, but his son and successor, Bayezid I (r. 1389–1402), continued his father’s expansionist policies, pushing the boundaries of the Ottoman sultanate to the borders of Albania. Albanian princes were forced to submit, pay tribute, and demonstrate their loyalty to the Ottoman sultan by sending their sons as hostages to his court in Edirne (Adrianople). Gjon (John) Kastrioti, the ruler of Emathia in central Albania, was one of these princes; he sent his son, Gjergj (George) Kastrioti (1405–1468), to the court of the Ottoman sultan in Edirne. After he had arrived in the Ottoman court, Kastrioti converted to Islam and received a traditional Ottoman education. He also participated in the Ottoman military campaigns against Serbs and Hungarians, displaying unrivaled courage and bravery on the battlefield, which won him the name Iskander or Skander (Alexander), after Alexander the Great, and the rank of bey (hence Iskender Bey or Skanderbeg). When the armies of the Ottoman sultan Murad II (1421–1444, 1446–1451) were defeated by the Hungarian general János (John) Hunyadi (1407–1456) at Nish in present-day southeastern Serbia in November 1443, Skanderbeg deserted Ottoman service and returned home to Albania. Once there, he renounced Islam and re-embraced Christianity. In 1444 Skanderbeg created a league of Albanian princes, which repeatedly defeated the Ottomans. The Ottoman armies were defeated twice in 1450, then again at the battle of Mokrea in 1453, and yet again in 1456. In September 1457 Skanderbeg scored an impressive victory over the Ottomans west of Mount Tomoritsa, which he followed with the conquest of Satti (Shati) in present-day northwestern Albania in 1459. Skanderbeg and the Ottoman sultan, Mehmed II, agreed to a truce in 1461, but this proved to be short-lived. In 1462 Skanderbeg was back on the battlefield, fighting two successful campaigns against the Ottomans in the Dibra in present-day western Macedonia, followed by a successful invasion of Macedonia. Once again a peace treaty was negotiated, in April 1463. 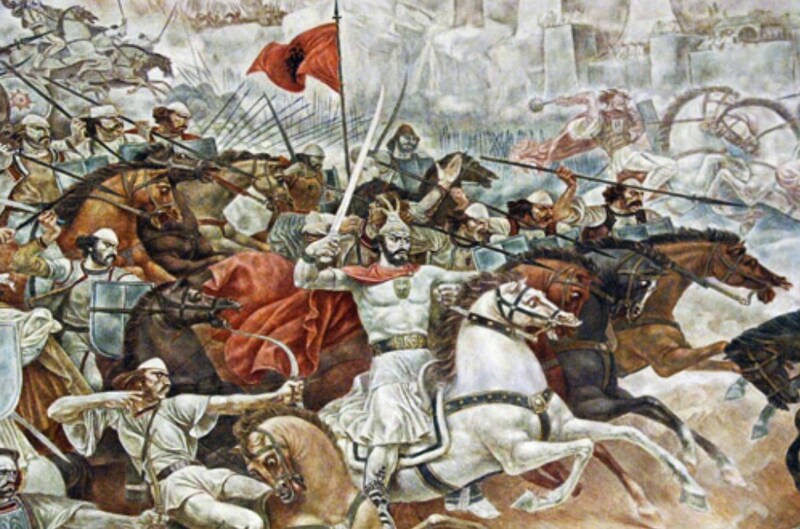 Conflict resumed in 1464, with Skanderbeg inflicting defeats on the Ottomans twice in the Dibra, followed by yet another victory near Tirana (present-day capital of Albania) in 1465. To the shock of the Ottomans, in 1466 at Kroya (Kruja) in north-central Albania, Skanderbeg attacked and defeated a large Ottoman army led by Mehmed II, the conqueror of Constantinople (Pitcher: 88). In 1467 he repeated this feat, first defeating an Ottoman army led by the Albanian commander Ballaban near Kroya, then repelling Mehmed’s second major campaign to pacify Albania (Pitcher: 88). Considering this extraordinary set of accomplishments and victories, it is not surprising that Skanderbeg was and remains to this day the unchallenged national hero of the Albanian people and a legend in European history. In his battles with the Ottomans, Skanderbeg received assistance from the papacy, Naples, and Venice. He formed a formal alliance with Venice in 1463. Skanderbeg died in January 1468. After the death of Skanderbeg, Albanian resistance continued for another decade. In 1477 the Ottoman commander Gedik Ahmed Pasha besieged Kroya, the birthplace of Skanderbeg. The town surrendered to the Ottomans in June 1478. Scutari (Shkodër) in northwestern Albania then surrendered to Mehmed in 1479. By 1501 the Ottomans had pacified much of the territory of present-day Albania. Albania remained part of the Ottoman Empire until 1912, when the country declared its independence. As the Ottoman Empire began to disintegrate in the 19th century, the Albanians, who had remained loyal to the sultan, began to organize their own national movement as a means of protecting their communities from encroachments by their Greek and Slavic neighbors. In the earlier part of the 19th century Albania had been divided between two pāshālik, both of which enjoyed considerable autonomy. Ali Pasha of Janina and the Bușati (Bushati) family of Shkodër had dominated Albanian politics for decades. In 1820 the Ottoman sultan, Mahmud II, who was determined to impose the authority of the central government over the empire’s distant provinces, dismissed Ali Pasha and attacked his territory. Ironically, the suppression of Ali Pasha, who was killed by Ottoman agents in 1822, allowed Greek nationalists to stage their revolution against the Ottoman Empire. Following Ali Pasha’s downfall, the Ottoman government turned against the head of the Bușati family, Mustafa Pasha. After his defeat at the hands of Ottoman forces, Mustafa Pasha accepted his fate and settled in Istanbul, where he lived the rest of his life (Jelavich: 362). The establishment of direct Ottoman rule over Albania allowed the government to introduce a series of reforms. The principal objective of these reforms was to remove the intermediary class of notables and replace it with a new administrative organization run by officials sent from Istanbul. The Ottoman government also intended to bring under its control the local landowners who had converted the old timārs into privately owned estates and create a more efficient tax collection system, which would increase the state revenue. The central government also wished to establish a new recruitment system, which would provide troops for a new military force. In implementing this ambitious agenda, the sultan abolished the timārs in 1832 and created two eyālets of Janina and Rumelia, which were reorganized into the three vilāyets of Janina, Shkodër, and Bitola in 1865 (Jelavich: 362–363). The reforms introduced by the central government in Istanbul were vehemently opposed by the notables who preferred being ruled by their own local beys. But, it was the inability of the Ottoman state to protect Albanian communities from Greece, Serbia, and Montenegro that forced the Albanians to arm themselves and organize their own independent national movement. The Ottoman defeat at the hands of the Russians in 1878 and the Treaty of San Stefano, which rewarded Serbia, Montenegro, and Bulgaria with Albanian-populated areas, marked the beginning of a transformation in the relationship between Albania and the central government in Istanbul. Until 1878 the Ottoman government, which viewed the majority of Albanians as members of the Muslim community, did not treat them as a separate national group. Muslim Albanians, who attended school, studied Arabic, the language of the holy Quran, and Turkish, the language of the government and the army. Christian Albanians, on the other hand, were viewed as members of the Christian Orthodox community, who studied Greek as the principal language of their religious community (Shaw: 2:199–200). In response to the signing of the Treaty of San Stefano, a group of prominent Albanian leaders organized a secret committee in Istanbul and called for a larger gathering at Prizren in June 1878. The meeting at Prizren brought together Muslim and Christian Albanians, who agreed to create the League of Prizren. The league had the authority to collect taxes and raise an army (Shaw: 2:199; Jelavich: 363–364). It also sent an appeal to the European powers participating in the Congress of Berlin, which was ignored (Jelavich: 364). With Serbia and Montenegro emerging as independent states, the Ottoman government was forced to negotiate the delineations of its new borders with the two countries. Since several towns and districts, such as Bar, Podgorica, and Plav, that were handed over to Montenegro had significant Albanian populations, the League of Prizren turned to resistance. The Ottoman government was caught in a dilemma. It had to abide by the terms of the Congress of Berlin, but it was also determined to benefit from Albanian resistance and use it as a means of reducing its territorial losses (Jelavich: 364–365). With arms from the Ottoman government, the Albanians resisted the occupation, forcing the European powers to recognize the power of the newly emerging nationalist movement. Realizing the intensity of Albanian national sentiments and the potential for eruption of ethnic conflicts, the European powers reversed their position and agreed to allow Plav and Gusinje to remain within the Ottoman Empire. Instead, they offered a port, namely Ulcingi (Dulcigno), to Montenegro (Jelavich: 365). But the Albanian resistance was not confined to the towns and districts that were handed over to Montenegro. There was also strong opposition to handing over any Albanian territory, such as Epirus, to Greece. In 1881 the Albanian resistance against Greek occupation of Epirus forced the European powers to agree that aside from Thessaly, the Greeks would only receive the district of Arta in Epirus. Despite the successes of the Albanian resistance and the support it enjoyed from the Ottoman government, the sultan remained bound by provisions of the agreement to hand over Ulcinji to Montenegro even if it meant crushing the Albanian League. An Ottoman army was dispatched to capture Prizren, which fell in April 1881 (Jelavich: 366). Another Ottoman force routed the Albanian resistance at Ulcinji before the town was handed over to Montenegro. Despite its suppression, the League of Prizren had accomplished a great deal. The European powers had recognized that Albanian lands could not be partitioned among their Balkan allies without formidable resistance from the local population (Jelavich: 366). Ottoman rule in Albania ended shortly after the eruption of the First Balkan War in October 1912. On October 8, 1912, Montenegro, a member of the Balkan League, declared war on the Ottoman Empire. The other members of the Balkan League, Greece, Serbia, and Bulgaria, followed suit 10 days later. The Bulgarians quickly seized Thrace, defeating the Ottomans at the battles of Kirklareli/Kirkkilise (October 22–24) and Lüleburgaz (October 22–November 2). The Serbs also scored an impressive victory at the battle of Kumanovo (October 23–24) in Kosovo Vilayet in present-day northern Macedonia. The Greeks captured Salonika on November 8. To the west the Serbs went on to capture Bitola in present-day southwestern Macedonia and joined forces with Montenegrins, who besieged Shkodër in northwestern Albania. The Serbs eventually would seize Durrës on the western coast of Albania. Without a coordinated plan and in the absence of a unified command, the Ottomans were forced either to retreat or to take defensive positions. The major urban centers of the empire in Europe (Edirne, Janina, and Shkodër) were surrounded by armies of the Balkan League. By December 3 the Ottoman government was willing to conclude an armistice. As the discussions dragged on in London, Bulgaria demanded the city of Edirne. This was too much for a group of young officers in Istanbul, who staged a military coup on January 23, 1913. The former commander of the army, Mahmud Şevket (Shevket) Pasha, assumed the posts of grand vizier and minister of war. When the news of the coup in Istanbul reached London, the Balkan states resumed their military campaigns. Bulgarian forces captured Edirne on March 28, and the Serbs entered Shkodër on April 22. On May 30 the Ottoman government was forced to sign the Treaty of London, which resulted in the loss of much of its territory in Europe. Instead of worrying about the disintegration of the Ottoman state in the Balkans, the Albanian nationalists were increasingly more concerned about Serbia, Greece, and Montenegro undermining Albania’s territorial integrity by invading and occupying Albanian-populated cities and towns. It was under these circumstances that the Albanian leader, Ismail Kemal Bey Vlora (1844–1919), known in Albanian as Ismail Qemali, returned to Albania with the support and blessing of the Austro-Hungarian Empire to convene a national assembly, which declared Albanian independence on November 28, 1912, in the coastal town of Vlora (Vlorë) in southern Albania. Jelavich, Barbara. History of the Balkans: Eighteenth and Nineteenth Centuries. Vol 1. Cambridge, UK: Cambridge University Press, 1983. Jelavich, Charles, and Barbara Jelavich. The Establishment of the Balkan National States, 1804–1920. Seattle: University of Washington Press, 1977. McCarthy, Justin. The Ottoman Turks: An Introductory History to 1923. London and New York: Wesley Longman Limited, 1997. Pitcher, Donald Edgar. An Historical Geography of the Ottoman Empire. Leiden: E. J. Brill, 1972. Quataert, Donald. The Ottoman Empire, 1700–1922. Cambridge, UK: Cambridge University Press, 2005. Shaw, Stanford J. History of the Ottoman Empire and Modern Turkey. 2 vols. Cambridge, UK: Cambridge University Press, 1976. Sugar, Peter. Southeastern Europe under Ottoman Rule, 1354–1805. Seattle: University of Washington Press, 1977. Zürcher, Erik-Jan. Turkey: A Modern History. London: I. B. Tauris, 2004. This entry was posted in Crusades, Ottoman by MSW. Bookmark the permalink. “Albanians are believed to be the descendants of the ancient Illyrians.” theory created by Albanian nationalists, in reality Albanians first came to Balkans in XI century (1042). “A coalition of Christian states” – a coalition of Serbian states actually. “Kosovo Polje (Plain of Blackbirds)” in Slavic language, not Albanian. Nothing to do with Albanians whatsoever. Skenderbeg himself was not even an albanain, his father was Greek and his mother was Serbian. “There was a strong opposition to handing over any Albanian territory, such as Epirus, to Greece.” Who said that Epirus was Albanian territory?!! “In 1881 the Albanian resistance against Greek occupation of Epirus”. Occupation? It was greek land liberated from ottomans, and albanian muslim guerrillas paid by Ottoman sultan were terrorizing greek civilians. Albanians always served Turkish sultans, they were Turkish bloodthirsty auxiliaries, without any trace of national identity (until Austro-Hungary and Italy created their nation from mountain tribes in late 19th century). I’m not going to waste my time on this propaganda piece any further, but please stop quoting albanian fascist propaganda.